Normally, a power system operates under balanced conditions. When the system becomes unbalanced due to the failures of insulation at any point or due to the contact of live wires, a short–circuit or fault, is said to occur in the line. Faults may occur in the power system due to the number of reasons like natural disturbances (lightning, high-speed winds, earthquakes), insulation breakdown, falling of a tree, bird shorting, etc. In such types of faults, all the phases are short-circuited to each other and often to earth. Such fault is balanced in the sense that the systems remain symmetrical, or we can say the lines displaced by an equal angle (i.e. 120° in three phase line). It is the most severe type of fault involving largest current, but it occurs rarely. For this reason balanced short- circuit calculation is performed to determine these large currents. Three-phase short circuit fault (LLL). In single line-to-ground fault, one conductor comes in contact with the ground or the neutral conductor. A line-to-line fault occurs when two conductors are short circuited. A double line-to-ground fault occurs when two conductors fall on the ground or come in contact with the neutral conductor. LG, LL, and LLG are unsymmetrical fault while LLL and LLLG are the symmetrical faults. For this reason, balanced short-circuit calculation is performed to determine these large currents. Faults can damage or disrupt power systems in several ways. Faults increase the voltages and currents at certain points on the system. A large voltage and current may damage the insulation and reduces the life of the equipment. Faults can cause the system to become unstable, and the three-phase system equipment operates improperly. Hence, it is necessary that, on the occurrence of the fault, the fault section should be disconnected. So, the normal operation of the rest of the system is not affected. Thanks, but symmetrical fault or balanced fault, that’s is unbalanced system, does that mean that the system is balanced when unsymmetrical fault is involved? I think any system with fault is unbalanced…. Symmetrical fault involves all the three phases, and these phases carry the identical fault current which makes the system balance. The unsymmetrical fault affects two or more phases of the transmission line. Thus, the current becomes unsymmetrical in all the three phases and system become unbalanced. I think Rahul is asking about the primary current of the power transformer at the generating station?, I think it is balance but control center reduce the load on turbine through excitation current and sometimes if it is difficult to control, and control center re-rout the load into different transmission lines depends upon Ring or Radial system? 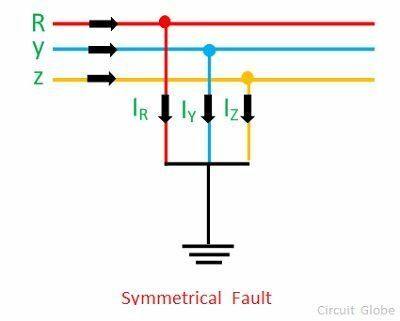 What is the difference of LLLG and symmetrical fault?